Waikiki Sunset #3606 - INCREDIBLE Ocean views! Close to beach! A/C, WiFi, one Parking! My family and i were very pleased with this condo. The Lanai had a nice view of the ocean. The room is spacious and the bed is clean. We would definitely stay here again. Mahalo for the 5-star review, Aubrey! So glad to hear you and your family enjoyed your stay in this great condo! We look forward to your next visit! The location of this property is fantastic, right in the heart of the city with amazing views of Waikiki beach and Diamond Head. The balcony is lovely and a perfect place to relax after a full day of exploring the area. The amenities were as expected and described. The only downside was the cleanliness of the condo. The carpet is very dirty and could use a good shampooing. The return air vent looks like it hasn't been cleaned in a long time. There was also some hair in the shower when we arrived. But that didn't detract from our positive experience in Honolulu! Mahalo, Kendra, for sharing your comments about your recent stay. I was very unhappy to hear about the cleaning issues you encountered. Had you notified us immediately, we would have had Housekeeping back to the unit right away to make sure everything was up to our standards. In the future, please remember that the property manager is there to resolve any issues that may arise during your stay. We are delighted that you had a relaxing and enjoyable vacation and you appreciated the amazing views and location of this great condo! We look forward to your next visit to Waikiki. Unfortunately, our system doesn't translate Japanese yet, but we can see by your 4 5-Star rating, you enjoyed your stay in this beautiful condo! Lovely views from the 36th floor condo with its floor-to-ceiling windows. The well-located condo was clean, the kitchen was well equipped and there were lots of towels for the beach and pool. The only fault was that the condo carpet was tired and needs replacing. 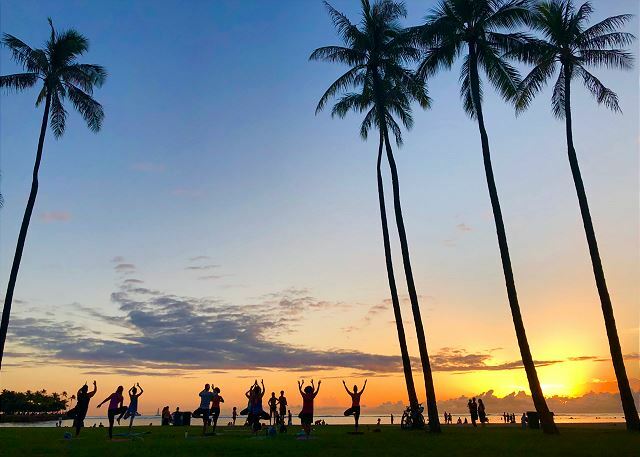 Mahalo, for taking the time to share your recent experience at Waikiki Sunset 3606! It's always great to get this kind of feedback - we're so glad you enjoyed your stay! We will pass your feedback on to your property manager, Paul, and hope to see you on your next visit to Waikiki! Mahalo, for the wonderful 5 star review! It's always great when customers acknowledge the good work of our team. Hope you are able to plan a return trip soon! Nice comfortable room. Everything I needed. Paul from Captain Cook responded to all my needs. I'm coming back in December! Mahalo! We appreciate the great 5 star review and feedback, we will look forward to your next visit! Drawbacks are the first come first serve parking and VERY busy elevators. Plan extra time for the elevator travel. Great kitchen but laundry is shared pay unit. My wife and I spent seven nights here. The condo was clean, well appointed, and matched the photos from the listing. The Captain Cook representative Byron was very courteous at check-in. The view from this unit is incredible. We had breakfast every morning on the lanai. Free parking is a nice perk. This is excellent location in which to explore Waikiki. I wouldn't hesitate to stay here again. Mahalo, for the lovely 5 star review! We're so glad you enjoyed your stay and pleased that you took advantage of the lanai and views of this fabulous condo! We look forward to seeing you on your next visit! Mahalo, Brandon, for the wonderful review and recommendation! Hope you are able to plan a return trip soon! Aloha Beverly, we thank you for sharing your comments and recommendation. We continually strive to improve our services and your comments and suggestions are extremely important to us. I will pass your feedback onto the team, and we look forward to your next visit! It was ok was disappointed as the towels had stains on them.The cups had brown stains in them it seemed that they were never washed properly. Also never had internet from Sunday afternoon and it still was not working when we left wednesday morning. Aloha Marion and thank you for sharing your comments about your recent stay. We apologize for the problems you encountered. It sounds like the housekeeping team missed the ticket on quality control. Had you notified us immediately, we would have had Housekeeping back to the unit right away to make sure everything was up to our standards. Please remember, our property managers work 7 days a week to see to any issues that may arise during your stay! We hope you’re able to return for another visit soon! We had a wonderful 10 days in this apartment which met all our holiday needs. Close to beach,Waikiki shops,buses,free wi fi and free car park. Waking up each morning with the most amazing view was the icing on the cake. Thanks for a memorable holiday.....we will be back! Mahalo Steve! Thanks so much for leaving such a great review and recommendation. We look forward to having you back for your next vacation! Amazing views from the room. Would rent again. The views from the room was better than the pictures showed on the site. Confidently located next to the beach. Walking distance from so many restaurants and activities. The parking pass was great for when we rented a car. Had everything we need to feel at home. The only negative things about the place was the dishes were a little dirty. I would wash them before using. The shower had mold in it. Underneath the shower head. The remote in the bedroom barely worked. The towel rack above the toilet was installed poorly. Don't use or it will fall off. And the carpet by the kitchen had a staple sticking out. I stepped on it many times until I pounded it down. We had trouble with the security code for the door but that was taken care of very quickly. Byron the property manager was very helpful and friendly. Overall we had a great time there. Aloha and thank you for alerting us to items which have fallen below our standards. We appreciate your business and sincerely apologize that you encountered these issues. While we're happy to hear you enjoyed your stay, we hope that on your next visit, you will allow your property manager to resolve any issue during your stay. They are on call for all guests 24/7. Mahalo! Mahalo for the 5-star review, Andrew! 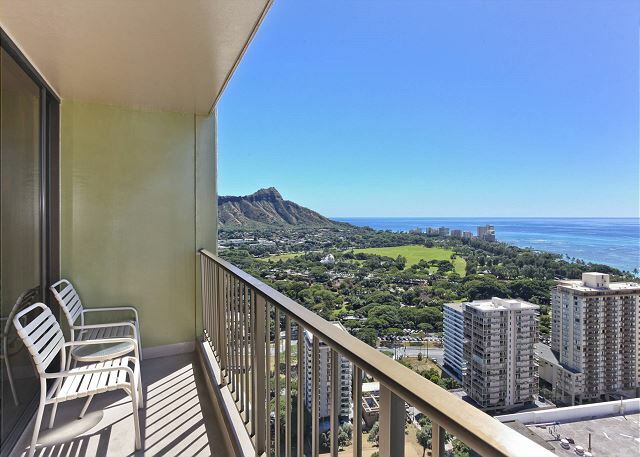 The unit has an absolutely spectacular view of Diamondhead and the beach. The only thing missing is a dishwasher, lol! Mahalo, Marcus! Always happy to have you stay with us (dishwasher or not!)! Mahalo, Craig, for sharing feedback about your recent stay! Like your suggestions about having a metal spatula and power strips! Hope you're able to plan another visit soon! Our rental experience was positive. Our initial reaction to the condo was not the best just because the pictures of the place looked a lot bigger than being in person. Once we drew the blinds back though, we were amazed! Being up 36 floors in front of Waikiki beach is something we will never forget. You can see Diamond Head, and the elephant hanging out at the Honolulu Zoo. Not to mention most of the ocean in front of Waikiki beach. Our contact name who takes care of the suite (Byron) was very friendly and informative. He ensured us to give him a call if we had any questions about the suite or touring Honolulu. There were a couple things that weren't right when we entered the suite (towel bar falling off the wall) but Byron got it fixed the next day. There are a couple things that need to be fixed for future guests, such as the curtain in the bedroom doesn't close all the way so it lets in a lot of sun in the morning when your trying to sleep in. Also there needs to be a protective layer of rubber, plastic or brass over where the carpet meets the kitchen and bathroom floor because stepping on it with your bare feet causes minor pricks on your foot from the under lay and carpet staples. Not a nice feeling. Also the fridge needs to be levelled correctly to prevent the fridge door swinging back and hitting the corner of the drywall. The shower drain also needs to be unplugged because the bathtub fills up the bath about a couple inches while taking a shower. The shower curtain also needs to be shortened. Just a few minor things. Other than that our experience was very very positive. We would stay here again for sure! Mahalo, Brett, for the great review! We truly appreciate the feedback and are working on the items you listed. Hope you can visit us again soon! Mahalo Eric and Erica for the fantastic review and recommendation! We appreciate the feedback and hope you are able to plan another visit soon! Mahalo, Denis! We hope you can plan a return trip soon! After a long flight, the moment we arrived and met Byron everything fell into place in this cozy one bedroom with gorgeous ocean view. Mahalo for the lovely review, Michael! We hope you can return for another visit soon! The building is located 4 short blocks from Waikiki beach and Kalakaua Avenue. Panoramic ocean view from the room on the 36th floor. Check-in process with the property manager was in person, easy and helpful. The unit was clean, comfortable, well stocked and had access to a laundry room down the hall. Wi-Fi was fast and reliable. A/C worked great. Plenty of dining options close by. The included parking garage is a real advantage to those who have a rental car. Will rent this unit again on any return trip to Waikiki. Mahalo Gregory, for the great detailed review and recommendation. We look forward to hosting you on your next visit! Great ocean and Diamond Head views from lanai !! 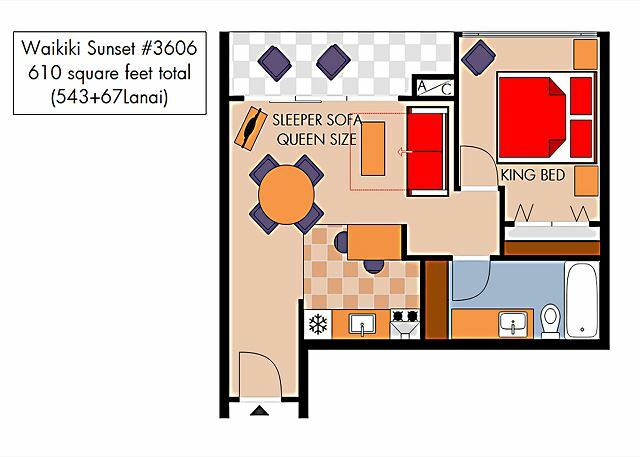 Good location from beach and within walking distance of Waikiki shopping, sights, and events. Great place if you want to have the comforts of home and freedom with no interruptions from housekeeping, etc. Condo had adequate supplies for one week; kitchen has what you need to prepare your own meals. Cleaner than hotel, as evidenced from leaving shoes at door and walking around barefoot. Only two of us, so we had enough room. We did not have any problems: a light bulb burned out, but replacement bulb was stocked in condo. The toilet would get air in pipe and sing now and then, but that did not bother us. Shower head was good! Appreciated vacuum and swifter on hand. Did not find scrubbing bubbles, Comet or Ajax under sinks and would have bought some if longer than 1 week stay. Maybe new pillows?Basic cable on TV was ok; internet service was great. Parking was good too. Not luxury, but relaxing and clean; a home away from home. Like many buildings in Waikiki it was a bit tired on the outside but the interior was good for our stay. Our property manager Byron was super prompt and helpful. Close to the beach and pretty much as described in the ads. Recommended for a good value holiday. Mahalo, Scott, for the great review! Mahalo, Evan! We appreciate your feedback! the place had everything we wanted and a view! it was really relaxing and walking distance to everything. Mahalo, Nicole! So glad you enjoyed your stay! Mr Wickard was extremely helpful, accommodating, w quick phone response time. Highly suggest leaving coffee,tea set up in room. Salt & Pepper don't count. After long hours of travel no one wants to have to shop for coffee, tea, shampoo, conditioner. Lack of amenities add one more chore to a vacation. I travel Int'l and USA 3-4 mons per year. These are basic provided amenities in majority of places especially at this price point. I don't know if no amenities was just this unit or all of Capt Cook Properties. Overall the unit was well appointed, clean, beautiful view. A couple could have 4 visitors for dinner comfortably. Checking in and out was easy. Mahalo, Liane, for choosing Captain Cook Resorts and thoughtful review and recommendation! Unlike a hotel, our guests stay with us from 3-180 nights so it is impractical for us to provide coffee or tea. We do work with a Island Grocery who can deliver specific grocery supplies prior to your arrival. We hope to see you on your next trip! We will come back again! Like the quietness yet convincence on the side of downtown. Service is good. The pool: I think the building traps the wind so it's windy in the the afternoon, but if you go to beach is nice and warm. Mahalo, Joanna, for the positive comments and recommendation! We hope you’re able to return for another visit soon! Thank you for taking the time to post comments about your recent stay. The condos at Waikiki Sunset are all privately owned - some are maintained by the onsite management company and others are not. The building amenities are shared by all, however. We apologize for the other management company's rude behavior - definitely doesn't sound like the Aloha spirit! We're sorry you didn't mention the beach towels to Byron, your property manager, as he would have replaced them right away. All in all, it sounds like you enjoyed your stay and we're looking forward to your next visit! Mahalo for posting a review of your recent stay and for alerting us that more glassware is needed. The glassware has been restocked; the toilet seat has also been replaced. The signage in the condo asks that guests please contact their property manager to resolve any issues during their stay. Our motto is, "If you’re not satisfied with your accommodations, please let us know right away so we can make it right!" We are committed to doing all we can to earn your repeat business. 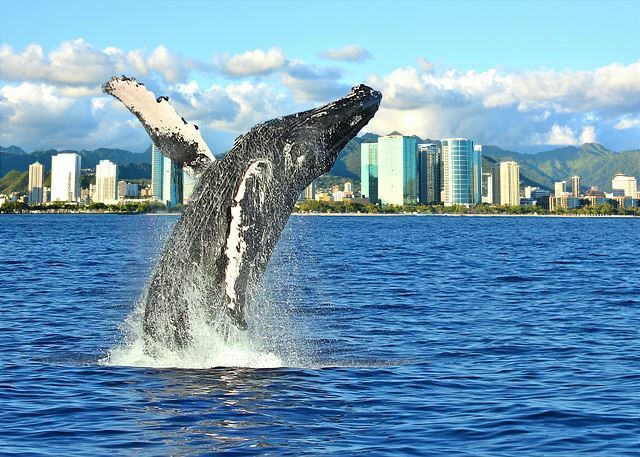 We're so glad you had a great time while on Oahu! Mahalo for the review and recommendation - we look forward to seeing you again! We don't have any complaints about this unit or our experience. Everything we needed was provided and there was plenty of space to accommodate us and our 9 month old daughter. Waking up to the view is the best part! Mahalo for the positive comments and recommendation! So happy your family had a memorable stay - and we imagine you'll be remembering that view for some time to come! We hope you're able to plan many return visits as your daughter grows! Location, location, location. Just one block from the beach, at the quieter end of Waikiki but still steps from restaurants and shopping, this 36th floor condo has everything: stunning views of the ocean and Diamond Head, included parking in the garage, and a one bedroom unit that has all you will need for a memorable stay in Honolulu. If you don't have a car there is a bus stop almost at your doorstep and note that you can get practically anywhere on the island via bus. Byron from Captain Cook met us at our car in the parking garage, escorted us to the unit. and explained all we needed to know about the rental. We had no issues during our stay, but help was never more than a phone call away if necessary. The bed, though slightly soft, was very comfortable , as was the entire unit; just some mold and dust in the bathroom marred its complete spotlessness. Everyone we had contact with from Captain Cook was very friendly and helpful; we would certainly be happy to rent unit #3606 again in the future. Thank you very much for the positive comments and recommendation! We work hard to offer great accommodations and service, and we're so glad your visit was enjoyable. I will pass your feedback on to our team, and we look forward to seeing you again soon. The apartment was in a great location, close to the beach, amazing views of the sun rise over Diamond Head and sunset over the ocean, and was very comfortable. Parking was a plus and rental shop were a plus too. Would stay here again. Mahalo for the great review and recommend! Great ocean views and 5 mins walk to the beach. Convenient parking is also included. Unit 3606 in the Waikiki Sunset - we staid here for a conference at the Marriott across the street. 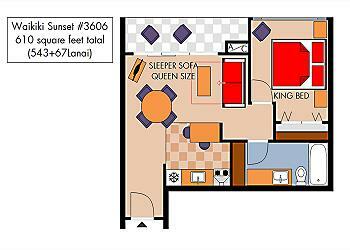 The unit is very clean, has a great 180 view from the Lanai (all buildings in front of it are shorter). 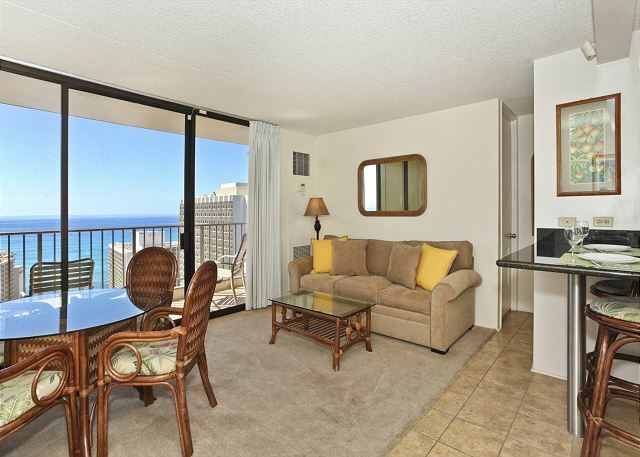 2 min walk to the beach, 10 mins to the "heart" of Waikiki. Laundry and trash down the hall. The building is older (same vintage as almost all in Waikiki) but the unit has been remodeled. Would stay here again. Easy check in with Captain Cook real estate. We really enjoyed our stay here. The room had a great view and it was always enjoyable to wake up and eat breakfast on the lanai. The room was clean and was just enough space for the four of us. We all commented on how we enjoyed the quieter end of Waikiki beach. Everything is within easy walking distance including the beach. Thanks to Byron for an easy check-in and tips on the area. The photos of the room are absolutely accurate. It was a great place to stay and we would definitely stay again! As advertised, nice location, view and well-equipped. The carpet is a little "worn" but the unit was clean and the lanai was very nice. Captain Cook was easy to work with and rental was smooth. Would definitely come back and stay here again. The accommodation was very nice, personnel were all experts in customer service and the location was convenient to all activities located in the area. One of the best values on Waikiki! This is the best view you can get for the price on Waikiki. Really fabulous. Very close access to the beach and all that surrounds it. Safe neighborhood. Attentive service from Capt Cook. A nice pool; not excessive but nice and uncrowded. Furnishings are not "luxury" but very comfortable. Better for 2 than for 3 or 4, but we brought our teenager granddaughter and the space was more than livable. Elevators work and do not get bogged down with congestion. We were very happy with out stay. We'll recommend to friends and hope to stay here again when we return to Oahu. We came in on an early flight after having just booked the day before. We had received a detailed email about what to do when we arrived on the island. They had an agent there to meet us and let us check in early since the apartment was available. It was very clean and the view was absolutely amazing. The apartment was well stocked and even included laundry supplies. There was a laundry room right down the hall. The walk to the beach was quick and the location was excellent. 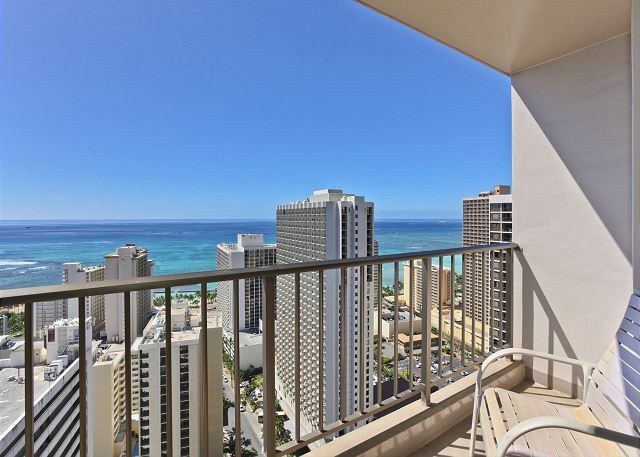 On the 36th with only two floors above, you are above most of the other high-rises and have great views of the Waikiki beaches, surfers, etc. directly in front and to the left Diamond Head. Sunset can also be seen between buildings (at least in April). 5 min. to the strip. I'd stay here the next time. Everything was outstanding. This has been our "home away from home" for our holidays the last 2 years. The Captain Cook staff were terrific to deal with from start to finish. Thanks to Byron, Paul and all the ladies in the reservation office, everyone was excellent. Unfortunately you have changed the pricing from monthly price to daily rate(No price break for over 30 days) otherwise, I would have booked again for next year. I was able to book another condo with a monthly price break with another company. Please consider bringing back the monthly price break for us longer staying customers. As always we were very pleased with our rental. Byron was waiting at the entrance with our keys. Keep up the good work. See you next March for a repeat visit. Condo was as described; incredible view of ocean and Diamond Head. If not for the pricing change from monthly rates to daily; we would have rebooked for next year. Thanks to Byron and all the gals in Captain Cook office. You have all been wonderful to work with. We were able to find a good condo for same monthly rate we had at the Sunset. Great location, we could walk everywhere for dinner and beach. We stayed in this property after paying much more for a similar room in a hotel 2 years ago. We didn't receive much service in the hotel so we decided a vacation rental might be better. The room was clean, well appointed and had a great view. We were comfortable and enjoyed our stay. Our representative from Captain Cook Resorts went beyond the call of duty to help us with a repair - we compared this to our previous hotel experience where we were given tools and instructed to complete the task ourselves! Very happy and would stay here again. A view from the lanai is splendid. Though the facilities was old, it was no problem and we were able to spend our staying there comfortably. The staff of Captain Cook Resorts was very helpful and friendly. 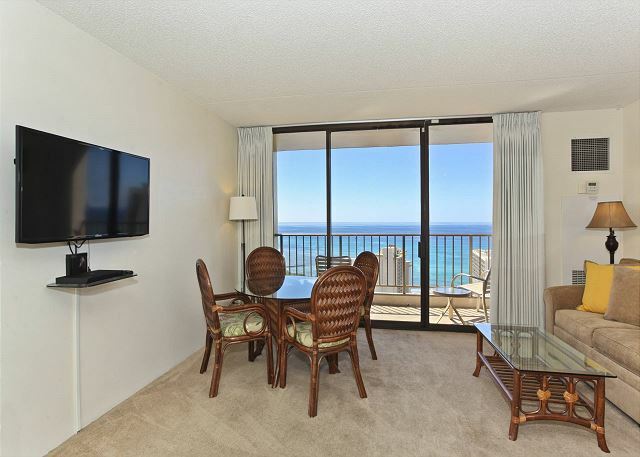 This is a nice one BR unit on the 36th floor of a building two blocks off the beach on Diamond Head end of Waikiki. The view of the beach/park/Diamond Head is stunning, and given its at the Diamond Head end, and its on the 36th floor, its quiet. The only minor drawback is that the unit does not have a dishwasher--if you eat in a lot, you will be reminded why modern homes have them, if you don't eat in then it's not an issue. Would stay there again, would recommend to friends/family. Waikiki Sunset #3606 was a wonderful experience and one that we will, hopefully, be able to do again. The view from the lanai was unbelievable and the location to the beach, International Market, etc. was well within walking distance!! Needless to say, we would recommend this property to any one who asks!!!! Overall our stay was very good except for the traffic noise early in the morning. Stayed in this unit for 2 weeks in Nov. Condo was nicely furnished and very comfortable. Everything was as stated by Capt Cook folks and Byron was helpful getting us checked in. Exterior painting of the building was mostly completed, however the recreation deck access was limited (we already knew it would be). Great location and affordable price. Aloha! Stayed 2 weeks and hated to leave! Hope to come again. The unit was perfect for us. Elevators.were fast never a wait. Laundry down the hall was easy and always available as well. The building was an easy walk to beach and shopping. Byron from Captain Cook Resorts met us on time and we were lucky to be able to check in early. Thank you Byron and Ingrid at Captain Cook Resorts for making our Waikiki vacation a dream vacation. Fantastic location, good quality property and we would recommend to others. Only downside for us was that the sofa-bed should have been replaced 10 years ago and the apartment was very dusty (Most likely the dust was due to the facade repair work taking place during our stay. Overall we were very happy with the property! Unfortunately sofa beds are never as comfortable as a proper bed, but we will take a good look at this one and if the mattress needs replacing we will contact the owner for permission to do so. As far as the condo being dusty - The buiding is undergoing painting and spaul repairs - it is advertised on our web-site and our guests are notified in advance of booking and also given a 25% discount if they wished to stay at the condo. The dust is something that we unfortunately had no control over and under normal circumstances would not be an issue. We are glad to hear that inspite of this the guests did enjoy the property. Overall I was pleased with our stay in 3606, however, I have just one complaint. We stayed there 15 nights and the bed linens were not changed during our stay. During check-in guests are informed that there is no maid service during their stay. Additional clean linens are provided in the unit. Guests are responsible for changing and laundering their own bed linens during long stays. Optional maid service in available for additional cost. We had a great 6 night stay. We had no complaints. We arrived early and was able to get an early check in which was nice. The view was the best part. Amazing views from the living and bedroom. The room was right near the elevator which was convenient and we never heard any outside noise. After reading the reviews, I was worried about the slow elevators, but we were pleased. There were four elevators and we didn't have to wait too long. It was nice having the parking space too; plenty of spots available. The only downfall I'll have to write was the water in the kitchen seemed to smell like rotten eggs. It wasn't a problem since we usually drink bottled water anyway, but wanted to mention. Overall, we would stay there again on our next trip! Only problems were the lighting was quite poor, and the bathtub drain couldn't be shut, so no nice bath, which we were looking forward to. We really didn't like having to park and return the garage pass because it was inconvenient and kind of a stupid routine. Garage people were rude and pushy. We have talked with the owner regarding your comments about the lighting. There should have been a stopper for the tub drain in the condo. A call to our maintanence department could have remedied that. I am sorry that the parking garage people were rude to you. The parking in this building is operated by a parking concession and unfortunately they did not express Aloha to our guests. I will almost certainly use this room again next time I'm in Waikiki. We apologize that our Property Manager was not able to give you clear directions; this is something that is being addressed. We will pass the information on to the building resident manager in regards to the slow elevator. I am unsure if a water filter would be of help if guest felt bottled water was not acceptable. The view from condo was wonderful!! The kitchen was very nice and upgraded. We enjoyed our stay. Our view from 36 stories high overlooking Waikiki and Diamond Head was truly breathtaking. Lots of construction made it very noisy, but that's life in the big city. We felt half the cost of the condo was for the view, even though it was comfortable and clean. The decor could be updated, but it would have to compete with the 180 degree view of the crater, Honolulu Zoo and sections of the pink beaches in the distant. We'll have to save up for a few years before we can afford to come back, but would love to! We certainly enjoyed our 1 week stay. The condo is clean and exactly as shown in the pictures. The view from the balcony is spectacular. The condo is located near the top of a very large building and elevator service is slow at times. A lot of families stay here so the pool often has a number of children in it. The building is centrally located and it is a short walk to the beach and shopping. We would recommend a car rental as indoor parking is included. Nearest large grocery store is about 2 miles. I've stayed in this unit on 3 seperate occasions and I like the location and the view is terrific. I'd like to see some upgrades though. The TV and entertainment center are outdated. The kitchen needs more counter space. These are minor things and would I stay there again? Probably. Just after the guest left, the final stage of the kitchen remodel was completed. There is now a breakfast bar with two stools. Please see photos. The owner is aware that the TV is older and it will be replaced next. We will contact our guest to let him know about the upgrades.